NESCA News & Notes: Why Does My Child Still Have Temper Tantrums? Question: My fourth grader still has temper tantrums. Why? Is that common in kids with executive functioning issues? Answer: If you’re the parent of a young child, chances are you’ve suffered through your share of tantrums. When a toddler is crying, yelling, and thrashing around, or kicking and hitting you, you feel pretty helpless. But tantrums are even more frustrating when your child is past the age when most kids grow out of them. Tantrums are essentially kids being overwhelmed by their emotions. Becoming more able to regulate your emotions is part of normal development. But not all kids are on the same timetable. By the time they’re 8 or 9, most kids have learned to handle strong emotions. They’ve developed language skills to express feelings like frustration and anger. They’ve learned to negotiate. Some of these skills are more difficult for kids with executive functioning challenges. And remember that kids with executive functioning issues may have tantrums simply because they’re dealing with more frustration than other kids. Kids who throw tantrums past the typical age may have found that it works for them. If you’re giving your child what he wants to end the tantrum, you’re inadvertently reinforcing that behavior. Does your fourth grader throw a tantrum when he doesn’t get his way, or something is particularly hard for him? He may need help learning to manage his emotions and communicate his feelings in a more grown-up way. You may need to make sure you’re not unintentionally responding in a way that encourages him to keep doing it. To help him, you’ll need to do two things: First, understand where this behavior is coming from—what’s triggering it. Second, you’ll need to help him develop the skills he’s lacking, instead of reinforcing his less mature tantrum behavior. In managing tantrums the first step is identifying what triggers them. Then consider ways the environment can be changed to reduce the incidence of outbursts. Anticipating those triggers, and modifying them so that it’s easier for your child to manage, is one way to eliminate tantrums. Does your son explode when you tell him it’s time to stop playing a video game and come to dinner? A series of warnings that dinner time is approaching might help him make the transition more easily. Does he tend to melt down over homework? You might build in regular breaks during homework time, and break intimidating tasks into smaller chunks. Avoiding a tantrum before it begins does not mean you’re “giving in” to your child’s demands. You’re giving him a chance to practice dealing with things that are challenging for him in a more mature way. 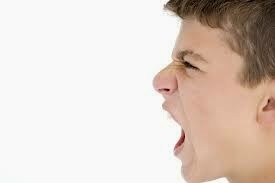 ADHD: In a recent study, as many as 75 percent of kids who had severe temper outbursts also fit the criteria for ADHD. Kids with ADHD have a very hard time waiting for what they want, tolerating situations where there’s not much physical activity, and making transitions. They’re not good at regulating their emotions, so their frustration often erupts into tantrums, anger or aggression. Anxiety: Kids are often good at keeping anxiety secret. By the time they’re in fourth grade they’re embarrassed to be afraid of things other kids aren’t afraid of. They may be terrified that their parents might abandon them, for example, or anxious that they might vomit. Then in a situation that stimulates these anxieties, they may lash out or melt down. Learning problems: Children who struggle with a particular subject may throw a tantrum. It’s so hard for them to do math problems, for example, that they get very upset. They may also have learned that if they melt down and get sent to the principal’s office, they’ll get out of doing the math. It’s an effective—if not very functional—escape strategy. Sensory processing issues: Sometimes tantrums, especially when they don’t seem clearly tied to a trigger, can be caused by oversensitivity to stimulation: bright lights, loud noises, crowds. A child throwing a tantrum may seem like he’s just trying to manipulate you. But the behavior is less voluntary than many parents realize, Dr. Dickstein notes. Kids with serious temper problems aren’t throwing tantrums on purpose. However, they may have learned, through reinforcement from adults, that tantrums get results. If a child encounters a problem, doesn’t know how else to handle it, and resorts to tantrums, he may well learn that, over time, this helps him get his way. “It becomes a vicious cycle,” says Dr. Lopes. “Instead of honing and practicing the skills that kids normally learn to solve problems collaboratively,” he explains, these kids are learning that throwing a tantrum is a viable way to escape a situation that’s upsetting them. When tantrums occur, resist the temptation to end them by giving your child what he wants. For outbursts that aren’t dangerous, the goal is to ignore the behavior. Even negative attention like reprimanding or trying to persuade him to stop has been found to positively reinforce the behavior. Withhold attention from behavior you want to discourage. Lavish it instead on behaviors you want to encourage. When he makes an effort to calm down or comply or propose a compromise, that’s when you want to respond. One thing you don’t want to do is try to reason with your child when he’s upset. As Dr. Dickstein puts it, “Don’t talk to the kid when he’s not available.” You want to encourage a child to practice at negotiation when he’s not blowing up, and you’re not either. You may need to teach techniques for working through problems, breaking them down step by step, if your son is immature or has deficits in this kind of thinking and communication. These are important skills for him to learn in order to do well in school and with friends, as well as to make family life more positive.